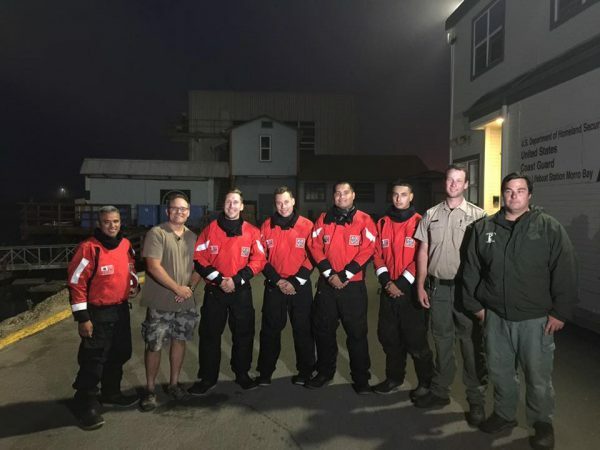 The United States Coast Guard and Morro Bay Harbor Patrol teamed up to rescue two boaters off the coast of Montana de Oro Monday evening. Shortly after 6 p.m., John Robinson saw what he believed was a person or persons in the water, according to the Coast Guard. Robinson quickly called 911, prompting a response from the Coast Guard, harbor patrol and Cal Fire. A Coast Guard 47-foot motor lifeboat rescued one person from a submerged vessel, while Morro Bay Harbor Patrol personnel rescued a second person. Both Robinson and one of the rescue teams filmed parts of the rescue. 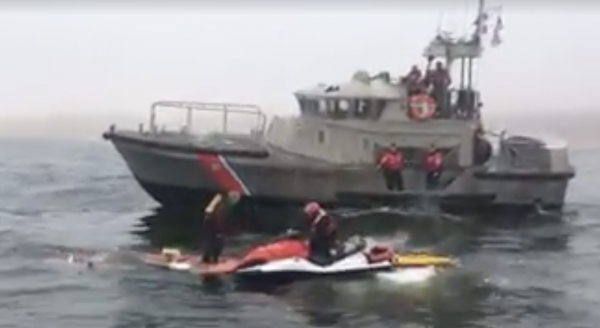 Close-up footage shows the Coast Guard rescuing a middle-aged or possibly elderly man from a small, sinking watercraft and transporting him by jet ski to the rescue vessel. Robinson filmed the rescue from shore and provided commentary. “Thank god I was here,” Robinson said at one point while filming. After the rescue was complete, Robinson posed for photos with the Coast Guard and harbor patrol crews. Well done Mr. Robinson, well done.